This article is about the Silicon Valley entrepreneur. For the web design author, see Eric Reiss. Eric Ries (born September 22, 1978) is an American entrepreneur, blogger, and author of The Lean Startup, a book on the lean startup movement. He is also the author of The Startup Way, a book on modern entrepreneurial management. While at Yale, he was co-founder of Catalyst Recruiting, an online forum for university students to network with potential employers. He took a leave of absence to pursue Catalyst Recruiting, but the company soon folded. After graduating, Ries moved to Silicon Valley in 2001 as a software engineer with There, Inc. He worked with the firm until the 2003 launch of its web-based 3D Virtual World product, There.com. The company soon failed. IMVU aimed to integrate instant messaging with the high revenue per customer of traditional video games. Ries and Harvey did not seek a large amount of initial funding and released a minimum viable product within six months. In 2006, the firm raised $1 million in its first round of venture fundraising from the Seraph Group, eventually raising an additional 18 million. In 2008 after a new CEO joined IMVU, Ries stepped down as CTO, remaining as a board observer. After leaving IMVU, Ries joined venture capital firm Kleiner Perkins as a venture advisor, and six months later started advising startups independently. Based on his experiences, he developed a methodology based on select management principles to help startups succeed. The lean startup methodology originates from a combination of ideas such as lean manufacturing, which seeks to increase value-creating practices and eliminate wasteful practices, and Steve Blank's customer development methodology. In 2008, Ries began to document the lean startup methodology on his blog with a post titled "The lean startup". He was invited to speak at the Web 2.0 Expo by Tim O'Reilly, and was offered a position as entrepreneur-in-residence at Harvard Business School. Ries began to devote all of his time to the lean startup movement, and held conferences, gave talks, wrote blog entries, and served as an advisor to companies. In 2015, he released The Leader's Guide, a self-published version of the curriculum used in his consulting work, exclusively through Kickstarter, raising $588,903 for its publication. In October 2017, he released a follow-up book, The Startup Way, which shows the application of entrepreneurial principles in larger corporate environments. Sales of The Startup Way were not as strong as Ries' preceding book The Lean Startup. In 2015, Ries began organizing The Long-Term Stock Exchange (LTSE), which is building a new U.S. stock exchange that aims to align the interests of companies and long-term investors and improve the public company experience. Ries had proposed the idea of the LTSE in his book The Lean Startup. On November 30, 2018, LTSE filed an application to the Securities and Exchange Commission for registration as a national securities exchange. ^ a b c d e Venture Capital: Eric Ries, author of "The Lean Startup". YouTube. November 21, 2009. ^ a b Loizos, Connie. “Lean Startup” evangelist Eric Ries is just getting started. Reuters. May 26, 2011. ^ a b c d Creating the Lean Startup. Inc. Magazine. October 2011. ^ Lohr, Steve. The Rise of the Fleet-Footed Start-Up. The New York Times. April 24, 2010. ^ a b c d Greenwald, Ted. Upstart Eric Ries Has the Stage and the Crowd Is Going Wild. Wired. May 18, 2012. ^ Roush, Wade. Eric Ries, the Face of the Lean Startup Movement, on How a Once-Insane Idea Went Mainstream. Xconomy. July 6, 2011. ^ Blank, Steven G. (2007). The Four Steps to the Epiphany: Successful Strategies for Products That Win (PDF) (3rd ed.). Pescadero, CA: S. G. Blank. ISBN 0976470705. OCLC 778813594. ^ Penenberg, Adam. Eric Ries Is A Lean Startup Machine. Fast Company. September 8, 2011. ^ Marshall, Matt. The youth beat goes on -- Phonebites and IMVU score funding. VentureBeat. February 28, 2006. ^ a b Eric Ries. Business Week. ^ a b Tam, Pui-Wing. Philosophy Helps Start-Ups Move Faster. The Wall Street Journal. May 20, 2010. ^ Bernhard, Jr., Kent. The Biggest Idea of 2011: Think Lean. Portfolio.com. December 30, 2011. ^ Solon, Olivia. Interview: Eric Ries, Author Of The Lean Startup. Wired. January 17, 2012. ^ a b Bury, Erin. How Eric Ries Changed the Framework for Startup Success. Sprouter. December 7, 2011. ^ In September 2008, Ries coined the term lean startup on his blog, Startup Lessons Learned: Ries, Eric (8 September 2008). "The lean startup". startuplessonslearned.com. Retrieved 4 June 2015. ^ Brustein, Joshua. The Follow-Up to The Lean Startup Is Available Only on Kickstarter. Bloomberg. April 6, 2015. ^ Ries, Eric. Thank you! Kickstarter. April 16, 2015. ^ "Editor's Choice: The Startup Way: How Modern Companies Use Entrepreneurial Management to Transform Culture and Drive Long-Term Growth". inthebooks.800ceoread.com. Retrieved 2017-11-26. ^ Lashinsky, Adam (February 26, 2018). "Famed 'Pivot' Strategy of Startups May Not Work For GE". fortune.com. Fortune. Retrieved October 17, 2018. ^ a b Delaney, Kevin (June 13, 2016). "A group from Silicon Valley has a serious plan for creating a totally new US stock exchange". Quartz. Retrieved 2019-02-08. ^ "Long-Term Stock Exchange, Inc.; Notice of Filing of Application for Registration as a National Securities Exchange under Section 6 of the Securities Exchange Act of 1934" (PDF). sec.gov. November 30, 2018. Retrieved 2019-02-08. 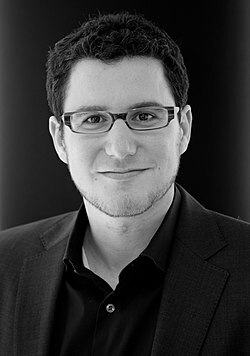 Wikimedia Commons has media related to Eric Ries.